A premier non-profit cultural organization formed in the year 1971 to promote the rich Telugu cultural heritage and language in Southern California. 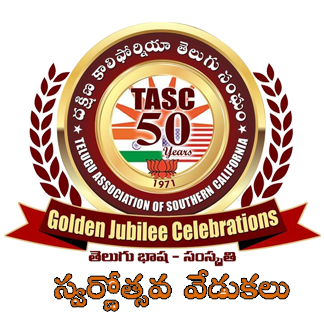 TASC was formed in the early 1970's as a non-profit organization to preserve, promote and celebrate the Telugu cultural heritage in Southern California. From its humble beginnings with a limited forum, the organization has grown by leaps and bounds to become one of the largest Indian-American organizations in California. Today TASC conducts many cultural activities and events every year aimed at not only celebrating our language, traditions, art and heritage but also championing the diversity of India. These events showcase the talents of our cultural groups while strengthening the bond of community through friendship and unity. We also organizes service initiatives like charity events and fundraisers to help the unfortunate. These initiatives are driven by the volunteerism and enthusiasm of our ever growing list of loyal members who contribute their time to such noble causes. TASC also publishes the Telugu Paluku newsletter before any major event during the course of the year. The newsletter is a source for members to contribute stories, jokes, news, observations, poetry etc.